Doug has spent decades traveling and experimenting with a wide variety of poultices and herbal applications. He has settled on his favorites that he uses to heal a wide variety of traumatic injuries.These include burns, gashes, sprains, glass splinters, and so much more! In the DVD “Treating Infections Without Antibiotics,” Doug will teach you his favorite combinations of herbal medicines. Combinations that promote healing without putting further burdens on the body! This video will show you what works for a poultice, how to apply a poultice and when to use a poultice. Help Your Body RESIST infection before it takes hold! 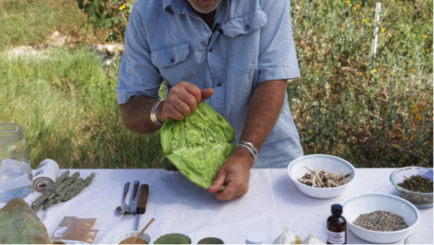 Doug will introduce you to a category of herbals that he refers to as Boundary Medicines . These herbals can prevent and treat both serious and minor infections. Ancient medical records from around the world prove…...Humans have been using poultices to heal wounds since at least 2,500 BC! Plants have evolved over hundreds of millions of years with their own anti-bacterial, anti-fungal, anti-viral, and insecticidal compounds. In a single herb, you can find between 200 and 2,000 different compounds working together! So it only makes sense: While it’s easy for bacteria to become immune to a single-compound antibiotic, it’s much harder for the same bacteria to become immune to the HUNDREDS … even THOUSANDS … of complex compounds found in herbs!